What Makes a Tier Three Appraisal Different? 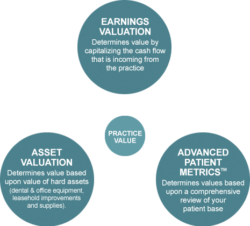 You deserve a valuation for your dental practice that reflects all the effort you’ve put into building it. Not all valuations are the same. Nor are all valuators the same. With what you have invested in your practice, you should expect a state of the art appraisal from a firm with a proven, long-term track record of appraising dental practices. 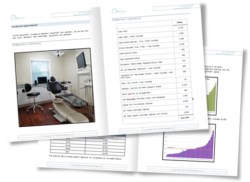 Your patient base is the single most valuable asset in your practice. It could be worth three to five times as much as all your hard assets put together. So shouldn’t your appraisal include a comprehensive review of your patient base? Surprisingly, many don’t. Tier Three developed its trademarked and copyrighted Advanced Patient Metrics® to address this issue. Using this proprietary approach to analyzing the patient base in a practice has the potential to identify and unlock value that other methods simply miss. Some appraisers will do a simple examination of a small portion of your charts. Others will expect you to provide the patient information about the practice. Tier Three is different. We have invested the resources to understand how to get far more detailed information directly from your practice management software. Depending upon your software, Advanced Patient Metrics® will be used to build a profile of not only your total patient flow, but also your hygiene patient base and new patient flow. Revenue per patient per year, for dentistry, hygiene and lab, will all be analyzed to identify financial upside within the practice. And it is all reported in a series of simple graphs that make it easy for you, and other users of the appraisal to develop a detailed understanding of the most important asset in your practice. 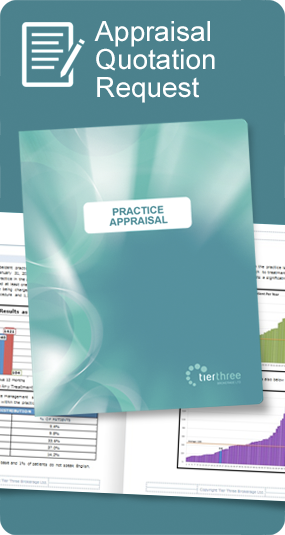 Every Tier Three appraisal includes a detailed analysis of your practice’s cash flow. It is the cash flow that an eventual purchaser of your practice will use to pay off their bank loan. Understanding your practice’s cash flow is more than a simple accounting exercise however. Costs that an eventual purchaser would not incur to operate the practice – things like wages paid to family members, or writing off a portion of your car – are added back to reflect a more accurate, and higher, cash flow. Our Advanced Patient Metrics® allow us to base the cash flow forecast not just on what you are doing, but on the inherent potential of the practice, which often identifies new sources of revenue. And it is all served up in an easy to understand forecast, both of the practice’s potential cash flow, and of a conservative loan repayment schedule so that readers can see that the practice is affordable. Every Tier Three appraisal also includes a detailed valuation of your hard assets. Leasehold improvements, dental equipment, office equipment, instruments & materials, and even practice management software are all assigned a value based upon our comprehensive asset database. This database is updated on a regular basis with price lists from major distributors and manufacturers for ongoing accuracy. Dental practices sell in a market with virtually no publicly available information. Accordingly, only a handful of professionals have access to the actual prices practices are selling for. If your appraiser is not actively engaged in the sale of a large number of practices annually, then you need to wonder how accurate their market appraisal will be. Your practice is too valuable to settle for an uneducated guess. Tier Three has been appraising and selling dental practices since 1982. That gives Tier Three both the depth and breadth of experience to put a value on your practice that reflects the rapidly changing nature of the dental practice market. In addition to unsurpassed experience with dental equipment, our management team brings many years of dental banking experience, practice management experience and sophisticated investment valuation experience to every appraisal we do. Because of this experience, our appraisals are routinely relied on by major Canadian financial institutions, accounting firms, and are routinely used in matrimonial and other legal actions where practice valuations are disputed. All the information in a Tier Three appraisal is served up in a format that is routinely credited with being easy to understand even for laypeople. Extensive use is made of colour, charts, graphs and pictures to increase readability and improve understanding. And we don’t just send it to you in the mail. A Tier Three representative will meet with you to walk you through all aspects of the appraisal. We’ll discuss not only the appraised value, but how it is arrived at, how your practice compares to other practices, what opportunities and challenges there are within your practice, and whatever next steps you are considering. You’ve put a tremendous amount of effort into building your practice. You deserve an appraisal that reflects all the effort you have invested.